My friend and I teamed up for the second time to bring forth yet another opportunity to showcase how easy (and affordable) it is to eat healthy. Here's the recap from March when we covered Grazing on the Go. We reviewed the Traffic Light Eating (TLE) concept and reminded our guests that we'd be focusing primarily in the green and yellow light categories. In the TLE, sometimes the foods we choose fall in what we consider the continuum and sometimes foods can straddle the yellow-red part of it. Anything with added unnecessary sugar (natural or not) can be considered in this section. If the sugar is refined and processed, it is a red light food, but if it is natural and the consumption has been lessened and depending on the other ingredients, it may fall closer to the yellow. One of the recipes we made today falls in the yellow continuum section. I filled the sink mid way with tepid water and added 3 tbs of white distilled vinegar. The strawberries soaked for about 5 minutes. Why this works: The vinegar kills bacteria and helps to dissolve the wax and contaminant residues found on the skins of many fruits and vegetables. I also covered that you can make a quick spray using a spray bottle, juice from 1/2 of a lemon, 3 tbs vinegar, and 1 cup water. Mist the produce, rinse and wipe clean. A few of the guests are doTerra reps and they shared with me that lemon E.O. can be used in place of fresh lemon but that smaller batches must be made to preserve the E.O. and if possible, to use a darker color bottle. The benefits of making your own produce wash: cheaper than store-bought, cleans more effectively than water alone, and all-natural (as even the store-bought types in health food stores can have lots of unnecessary ingredients). On the stove top, I reduced down 1 cup of sliced strawberries with 2 tbs of water and a pinch of coconut sugar. The strawberries weren't very sweet so I thought a pinch of natural sugar would compliment what we were making. The recipe for the strawberry reduction (without added sugar) is here. Dip 1 - Ingredients: 8 oz of softened Greek yogurt cream cheese, 2 tbs of powdered sugar (DIY here), 1/2 tsp vanilla extract, 1/4 tsp cinnamon, and 1 cup of strawberries. The tool, Power Chef System, in the right corner of the image above is what we used to make both recipes. Before I share the second Aloha Dip recipe, I showed the guests how to slice a pineapple. The way you may be thinking works great when your pineapple has sat on the counter a bit too long and most of the sides are yellow but IMO it requires extra steps of prep and you waste more of the pineapple. 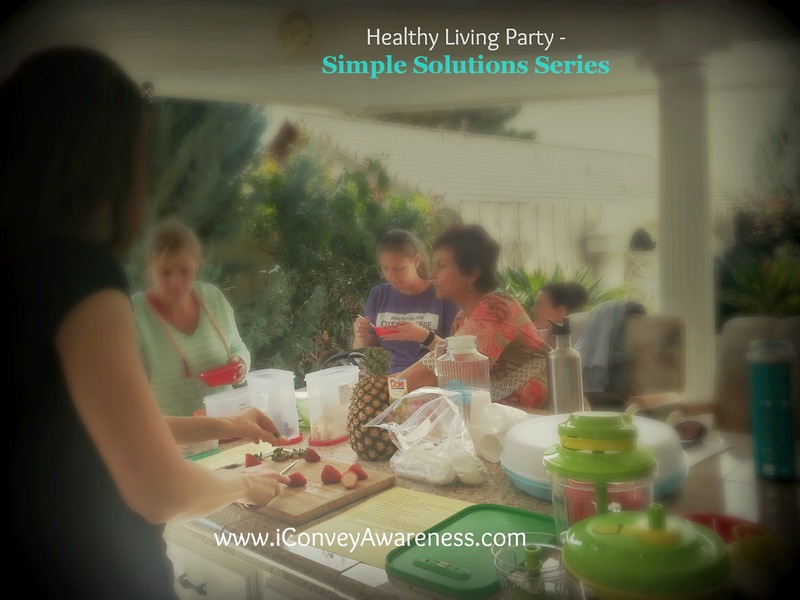 Visit my May Healthy Eating post here to see how I demonstrated cutting the pineapple. Dip 2 - Ingredients: 8 oz softened Greek yogurt cream cheese, 1/2 tsp vanilla extract, 1/4 tsp cinnamon, and 1/2 cup of fresh pineapple. We chose not to add the DIY powdered sugar to this recipe because the pineapple was very sweet already. The guests agreed that it didn't need it. This recipe was made as per the blog post (linked above) and I made a double batch as we had 9 adults and 2 kids in attendance. So -- which topic number fell in the yellow-red light continuum? Any guesses? Secondly, which topic above peeked your interest and one that you will be incorporating more of in your week?